Hola, amigos and amigas! It’s been pretty steamy here in San Diego over the past few weeks, so I’ve been getting creative about how to still do some cooking without making my house approximately 8,000 degrees. While not heat-free, using a slow cooker doesn’t heat up the place as much as the stove and oven do. 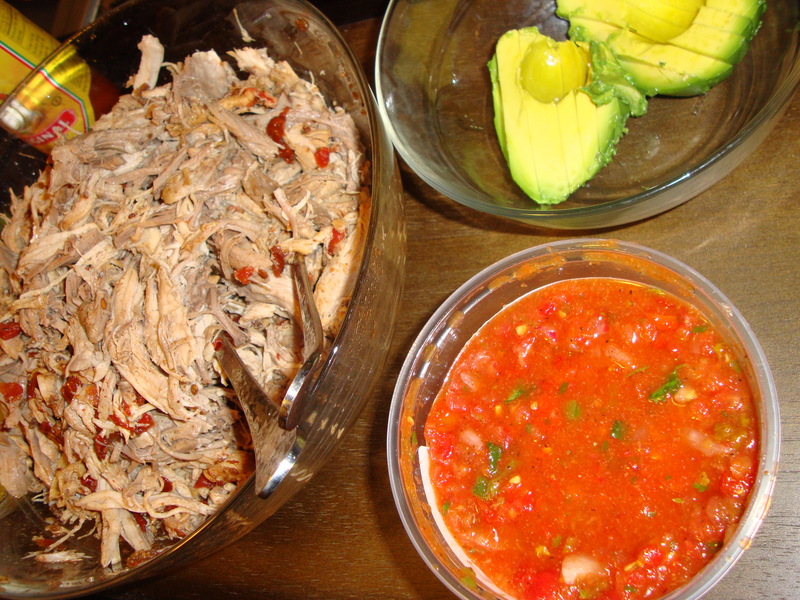 Enter slow cooker pork carnitas, which I found on the cool blog theKitchn. The result — super tender, slightly spicy, slightly citrusy pork that I made the centerpiece of some pretty delicious tacos. The best part — it’s so easy, you practically don’t have to do anything except shred the pork. Ah, the beauty of the slow cooker. The funny thing is that I VERY rarely eat pork. And VERY rarely will I cook this big a piece of meat. Not because I don’t like it, just because…well, I don’t know why! The carnitas was incredibly tasty in these tacos — this is the type of meal I could eat for lunch and dinner for four straight days, which is basically what I did. And you can totally switch up the flavors by using different toppings — cheese or no cheese, salsa or no, onion or no. Endless possibilities, friends. I set this up as a sort of taco buffet — take your tortilla, fill with carnitas, add whatever toppings suit your fancy. Supplement with some fresh tortilla chips — I recommend the ones from El Indio in Mission Hills. 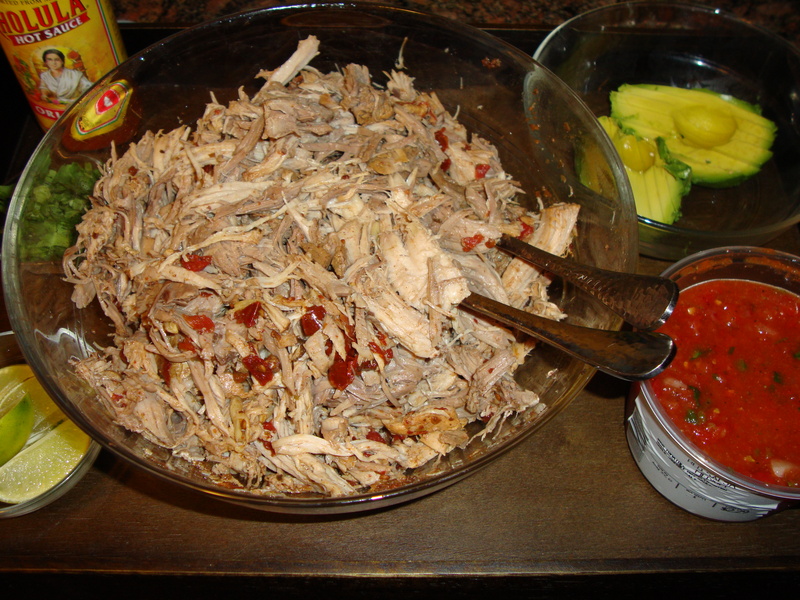 While shredding the pork is all you have to do, it isn’t easy, especially if you are picky about fat, which I am. I don’t want any in my carnitas, so it takes a little longer to make sure you’re picking it out. It’s worth the effort. I took the almost-falling-apart chipotle peppers and garlic cloves from the slow cooker and shredded them up with the pork for more flavor. This makes a lot of meat, so I froze some of it up in small portions so I can defrost it in one day for a meal that night. I used corn tortillas, but when I ran out and used flour, I actually liked them better. Call me crazy. I didn’t have a full cup of orange juice so I supplemented with grapefruit. I used diced tomatoes instead of tomato juice since I had them on hand. Must haves: avocado, hot sauce, cilantro. Fresh salsa from a Mexican market. Mmm. 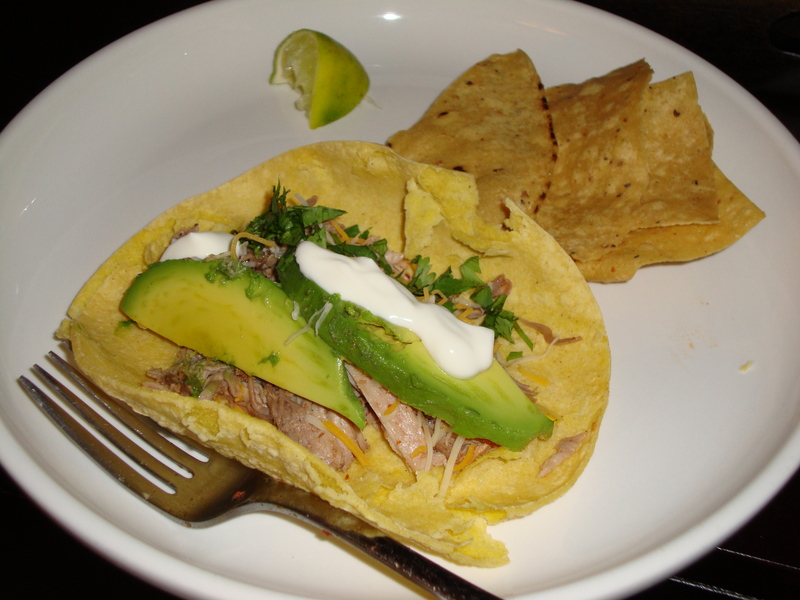 This entry was posted in Recipes and tagged carnitas, crock pot, pork, slow cooker, tacos by Tricia. Bookmark the permalink.